So if you’re one of my Facebook Likers or otherwise, you already know that I’m pretty stoked about this awesome event being held at Paper Source. 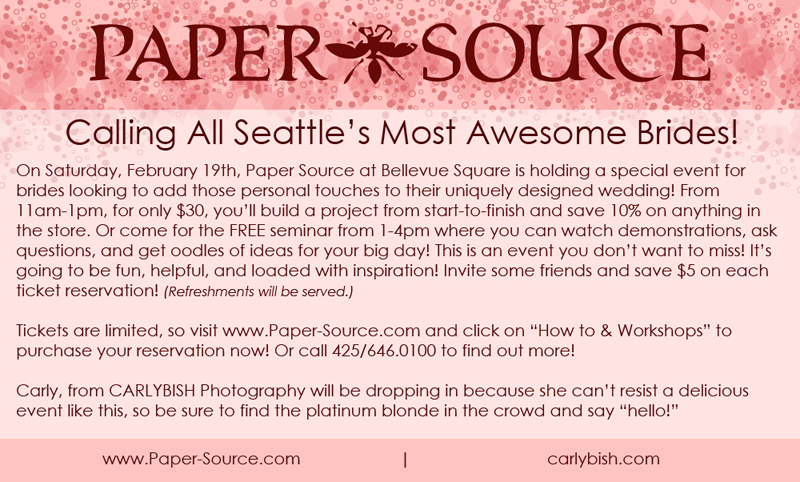 So I’m getting the word out to all the local Seattle brides that I’ll be attending this event at the one in Bellevue Square because I’m totally nerdy when it comes to paper goods. I love the amazing things that couples are putting together to personalize their weddings and this is a wonderful and affordable way to find inspiration, enjoy the planning process, and save on wedding products. So join us, won’t you?